The Acer Aspire One Happy has been announced, an Android netbook available in a range of colours. Offering Android as an alternative to the traditional Windows or Linux operating systems is going to be an interesting theme, with the mobile operating system a major hit in the phone world. The Acer Aspire One Happy is pitched very much at the non-techy audience, with Acer's release making it clear that this is all about...well colour. 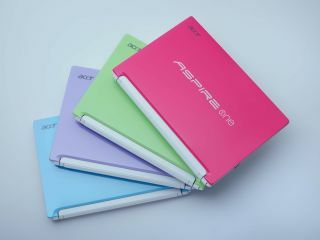 "As sweet as candy, scented as a field of lavender, brisk as lime juice or fresh as the ocean, Aspire One Happy comes in four delightful colours that fill your life with excitement and joy: Candy Pink, Lavender Purple, Lime Green and Hawaii Blue, four hip colours that transform this netbook into a fashion statement," asserts the computer giant. "Each one is just perfect to become the next must have digital accessory for young fashionable people who are highly mobile and want to create their own trends." More importantly, the specs are an LED backlit 10.1 inch screen, WiFi and the potential for embedded 3G, a weight of 1.25KG and 250GB of storage. Add in an Intel Atom N450 or dual-core Intel Atom N550 at its heart, the Aspire One Happy and 2GB memory and you have a decent level netbook with an Android twist. And some colours. Let's not forget the playful colours. The Acer Aspire One Happy is available now with a UK price of £249.99.